NAUGATUCK — Naugatuck police officials are seeking to bring a patrol officer position back into the fold. For the past five years, Naugatuck Animal Control has been manned by a full-time patrol officer. 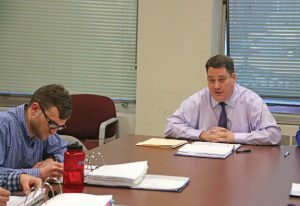 The 2019-20 budget request for the Naugatuck Police Department, which was presented to the Board of Finance last week, includes a plan to move the officer back to the police department’s roster, and borough officials would hire a person, who isn’t a police officer, full time to work at animal control, Police Chief Steven Hunt said. Hunt said having the patrol officer back on the roster could allow the department to potentially add a school resource officer at City Hill Middle School without creating a new police officer position. The Board of Education earlier this year supported the idea of hiring a school resource officer for City Hill. Naugatuck High School has had a school resource officer for about 10 years. The school resource officer assigned to Naugatuck High is an officer with the police department who works at the school during the school year. There are two full-time security guards at City Hill, but the school has never had a school resource officer. Mayor N. Warren “Pete” Hess said the finance board should postpone the discussion on a school resource officer for City Hill until speaking with school officials further about the matter. Overall, Hunt presented a budget request of about $7.04 million, which would increase police department spending by $371,627, or 5.56 percent, over the present budget. The largest spending increase comes in regular payroll, which is projected to go up nearly $260,000, or 4.76 percent, to $5.71 million. The increase is primarily due to contractual wage increases. The department’s equipment maintenance costs nearly doubled, rising by $59,500 to $119,939, under the proposal. Hunt said the cost is due to necessary radio system and software upgrades. The department is also requesting an additional $5,400, or 63.7 percent, for police officer equipment. In total, the equipment cost under the proposal is $13,875, which includes $8,160 for 12 new tactical vests. The vests are for new recruits and to replace ones that are old. The proposed spending plan was the first budget request presented by Hunt, who was hired as chief last month. Hunt told the Board of Finance that his goal is to earn the board’s trust and to present the truth. “My position right now is all about building trust and confidence with you folks. Keep in mind, I am a taxpayer too, so I want what is best for Naugatuck. I am going to be nothing but honest and transparent with you. You might not always like my answers, but I am going to be honest with you,” Hunt said.